Each author can make one or more blog entries. Each blog entry is posted by only one main author. Each blog entry can have many comments on it. 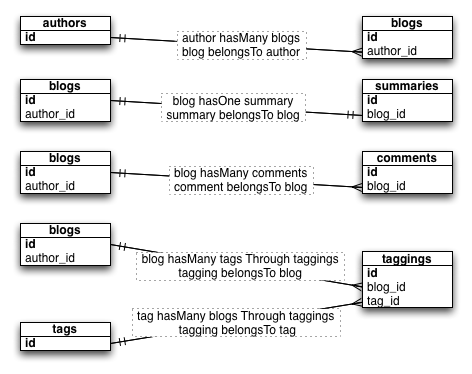 Each blog entry can have one or more tags associated with it. Each blog entry has summary data about how many comments there are, how many times it has been viewed, etc., kept separate from the content of the blog entry. Each of the many comments in the system is attached to only one blog entry. Each tag has one or more blog entries associated with it. Each summary is attached to only one blog entry. An Author "has many" Blogs. This is a one-to-many relationship. A Blog entry "belongs to" an Author. This is a one-to-one relationship. A Blog entry "has many" Comments. This is a one-to-many relationship. A Blog entry "has many" Tags associated with it, and at the same time "belongs to" those tags. This is a many-to-many relationship. A Blog entry "has one" Summary line. This is a one-to-one relationship. A Comment "belongs to" a Blog entry. This is a one-to-one relationship. A Tag "has many" Blog entries associated with it, and at the same time "belongs to" those blog entries. This is a many-to-many relationship. This many-to-many relationship is called "has and belongs to many" in some systems. In Solar, we call this a hasManyThrough because of the need to go through an AssociationTableMapping model. We will call this association model the Taggings through which Blogs and Tags relate to each other. Here is a graphical diagram of the domain tables and how they relate to each other, using the above terminology.